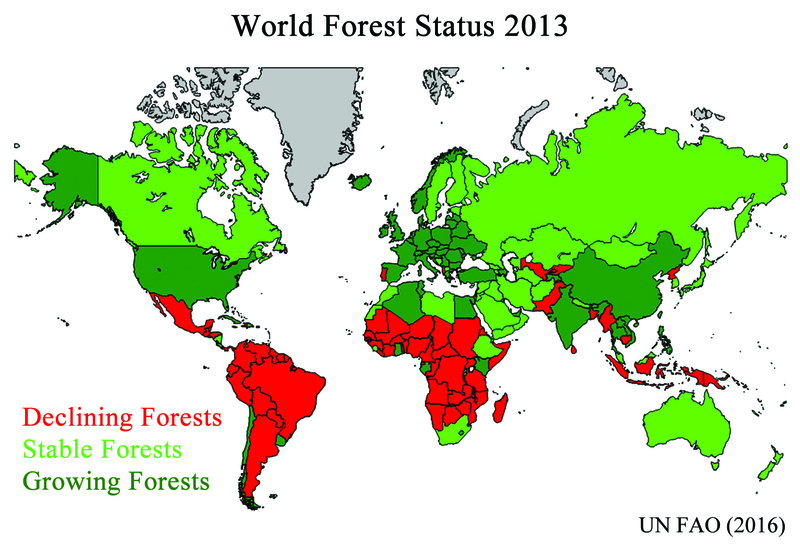 Today, forested area is declining in about one-third of the world’s countries, stable in one-third, and growing in one third (see map above). Forests are stable or growing in more than 100 nations, including Australia, Canada, China, India, Japan, New Zealand, Russia, the US, and in most of Europe. Forests in the United States have been growing for about 50 years. Today, more than 90% of US paper comes from high-yield forests planted specifically to be harvested. Company promotional campaigns to “go electronic and save a tree” have little factual basis, at least in the US. As the income of nations rises, deforestation changes to forest regrowth. Modern high-yield agriculture techniques reduce the need for additional farmland. Modern fuels, such as propane and natural gas replace wood for heating and cooking. The great promise of forest regrowth can be achieved by boosting the income of nations and the adoption of high-yield farming techniques, not by coercive sustainable policies to restrict forestry or agriculture. Paradoxically, policies to “fight climate change” are causing deforestation. Biofuel programs pursued by Europe and the United States during the last two decades caused an additional 41 million hectares of land to be used for ethanol and biodiesel production, an area the size of Germany. Rain forests in Indonesia have been cut down and replaced with palm oil plantations, so that feedstock for biodiesel can be shipped 10,000 miles to Germany to meet biofuel targets.